Anushka Sharma followed Virat's innings from India. 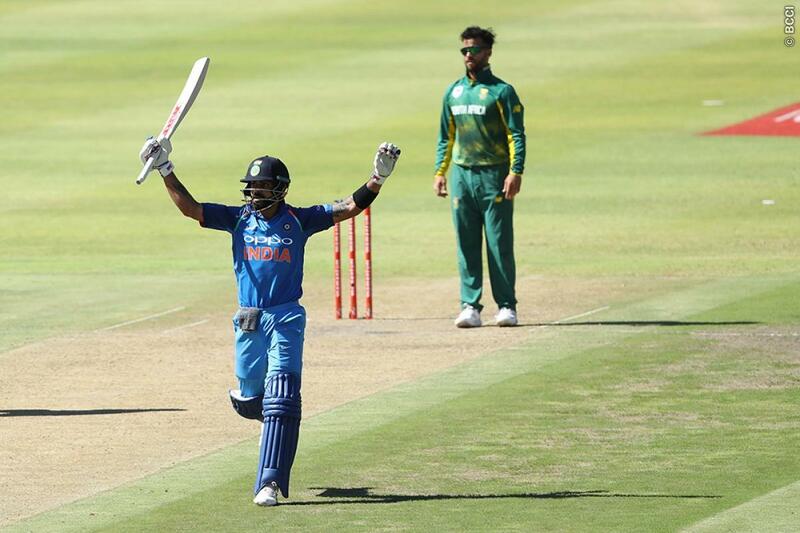 Virat Kohli continued his great run of form with yet another hundred today at Cape Town, his 34th in one-day internationals. Kohli finished on 160* off 159 balls with 12 fours and 2 sixes, taking India to a highly competitive total of 303/6 despite very little support from the other end, apart from Shikhar Dhawan who scored 76. Kohli scored only 60 runs in boundaries and completed 100 runs just through his running between the wickets, that too on a very warm day at Cape Town. It was an innings in two parts, as he had to deal with the sluggish nature of the pitch as well as keep strike with India losing wickets regularly at the other end, after the fall of Shikhar Dhawan's wicket. India was in danger of falling way short of the score they eventually got, but Virat Kohli's determination and clever farming of the strike ensured that India now have enough runs on the board to challenge the home side, who are missing three of their key batsmen in Quinton de Kock, AB de Villiers & Faf du Plessis. Virat Kohli's wife Anushka Sharma is not with him in South Africa, but she followed his progress from India and celebrated his unbeaten century on her Instagram account.